SBS Group, an industry leading information technology and consulting company, is ranked #10 on Accounting Today’s 2016 VAR 100. We remain energized and committed to delivering solutions that drive our client’s business further. SBS Group, an innovative IT services and consulting company, is pleased to announce its ranking on Accounting Today’s 2016 VAR 100 list. SBS Group was placed at #10 on Accounting Today’s list among some of the country’s leading value added resellers (VARs). Placement on the list can be attributed to SBS Group’s commitment to evolution and expansion, not only in accounting and ERP solutions, but also in the business intelligence, customer relationship management (CRM) and cloud technology spaces. In the past year, SBS Group has added more solutions to their cloud portfolio, launched a cloud marketplace (shop.sbsgroupusa.com) and invested to expand the business intelligence and CRM practices. 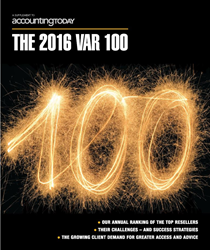 Accounting Today’s 2016 VAR 100 list is an annual report developed in order to rank the top resellers in the accounting space. The website is a leading provider of online news for the tax and accounting community. Accounting Today provides breaking news, in-depth features and editorial analysis. Accounting Today’s 2016 VAR 100 is available for download on http://www.accountingtoday.com.